Office Hours - Monday through Saturday - 10:00 am to 3:00 pm Pacific Time. Closed Sundays. Phone and Mail Orders Welcome! Were you born before 1964 and perhaps are afraid of the DOT COM? Fear not. Skip computer online ordering. Just dig up a live person by calling (951) 600-7154 and place an order by phone, or write to us at at the address above. We honor all major U.S. credit cards through PayPal (www.paypal.com) and accept U.S. money orders from USPS, Western Union, major banks and similar institutions. We also can accept your credit card information by phone or mail. Personal checks from U.S. banks are accepted but we place a 10-day hold on them to ensure clearance through our bank. For most items we ship through the U.S. Postal Service. Tracking is included. Special Note About Media Mail Shipping: In some instances it is the most inexpensive option for U.S. shipments, however, orders using this option can only contain bound books or DVDs/VHS tapes, nothing else. Comics and magazines (because of the ads) DO NOT qualify. We reserve the right to cancel any Media Mail shipping order containing items that do not qualify, or we will require the customer to send additional funds to cover postage. Your order may be delayed because of this. We suggest doing separate orders if Media Mail is desired for books and/or DVDs and you intend to order other items that do not qualify. First-Class shipping in the U.S. is only available for items 15.9 ozs or less. First-Class shipping orders weighing more than 15.9 ozs will ship via Parcel Select Ground unless an expedited service such as Priority Mail or Priority Mail Express is selected. In some instances Priority Mail is less expensive than Ground in which case we would ship using that service. Our Reasonable Postage Policy: The shipping cost for each order is based on the actual weight of each item placed in the shopping cart. When many items, particularly magazines and books, are included in one order, the cart may calculate an unreasonable amount of postage. If there is a significant difference compared to our actual shipping cost, and you paid by credit card via PayPal, you will receive a partial refund. We also take advantage of flat-rate shipping envelopes and boxes whenever possible to save customers on postage. Replacements for magazines bent or dinged in shipping will not be made when insurance is not purchased or special handling is not requested before purchase. Generally, special handling such as boarding and boxing requires additional postage to be paid unless a flat-rate envelope or box can be used at our discretion. If insurance was purchased but a replacement magazine is not immediately available, a store credit will be given. Returns when first authorized by us must be returned unopened in original shrink-wrap or manufacturer packaging at the expense of the BUYER. Loose DVDs in and of themselves are not considered a defect unless a disc is damaged in transit. If insurance was purchased we will replace it with the same exact item, if available. If the item is not available, a store credit will be given in the amount of the original purchase price less shipping. Return shipping is the responsibility of the customer. Before initiating a return, the purchaser must contact us to receive a return authorization number. Refunds when first authorized by us will cover the original purchase price less initial shipping. Upon our receipt of the item within 10 days of the refund request, and returned unopened in brand-new condition (any shrink-wrap and other seals intact), we will initiate the refund through PayPal. A 15% restocking fee will apply. Please contact us for more information. Pre-Orders are sometimes offered with highly anticipated items not yet available from the manufacturer or distributor. This is a popular option for those who wish to reserve the item right away and avoid a quick sellout. Payment is required at the time of your order. If you add a pre-order to your regular order, your entire order will not ship until the pre-order is available for shipping. For this reason we recommend that pre-orders are made separately from regular orders to allow the regular order items to be shipped immediately (except for mailed payments by personal check which require a 10-day hold). Special Orders can be made by email or phone request and are generally available for hard-to-find or out-of-print items. Depending on whether or not we can locate the item, and at what price, a deposit may be required and full payment must be made within seven days of us notifying you of its availability. Layaway is available by special request. Inquire if interested. Payments toward the purchase are required monthly at a minimum, and a $5 layaway fee is added to each payment. Please read our policy for all international orders carefully. We accept international orders from only Canada, Australia, and some countries in Europe. All orders must include shipping insurance, available at the time of purchase. Orders from Canada and the United Kingdom also must have a confirmed PayPal shipping address (see www.paypal.com for details). We will not ship until the shipping address is confirmed. Orders from other countries for which we offer shipping must have matching names for the addressee and the PayPal account holder. If we have any concerns, we reserve the right to cancel any order and refund the purchase price. Delivery times to international destinations can take 28 or more days not including Sundays and holidays. If these delivery times are a concern, we suggest selecting Priority Mail International service rather than First-Class International parcel service. Customs Fees or other additional taxes or charges applied by foreign postal administrations are the responsibility of the buyer and are not included in our shipping and handling charges. We mark all international shipments as merchandise and at the actual value. We will not mark any shipment as a gift or understate its value. This is a violation of U.S. and international law. Since 1999, MyMovieMonsters.com has offered monster lovers vintage classic horror and sci-fi collectibles, including model kits, figures, magazines and movies circa the 1930s to the 1970s, featuring licensed or manufactured products from top companies such as Universal Studios, Sideshow Collectibles, Diamond Select, Mezco Toyz, NECA, Hot Toys, Toho/Godzilla, Moebius, MPC, AMT, Polar Lights, Revell, Dark Horse, Classic Monsters of the Movies, We Belong Dead, and others. Scary Monsters Magazine is our quarterly classic horror and sci-fi magazine "for Monster Kids, by Monster Kids." Usually running a massive 146 pages, it has the look and feel of the pulp monster magazines of the 1950s and 1960s. We also plan to publish SCARY and other special editions, as well as the annual Monster Memories Yearbook, which features letters, articles and photos submitted throughout the year by Monster Kids and lovers of classic horror and sci-fi. Please note, all ads, contact information and merchandise appearing in issues of our publishing properties prior to Scary Monsters Magazine #101 are no longer valid. All inquiries should be directed to scarymonsters@mymoviemonsters.com or 951-600-7154. Subscriptions are available on our website and by mail or phone order. 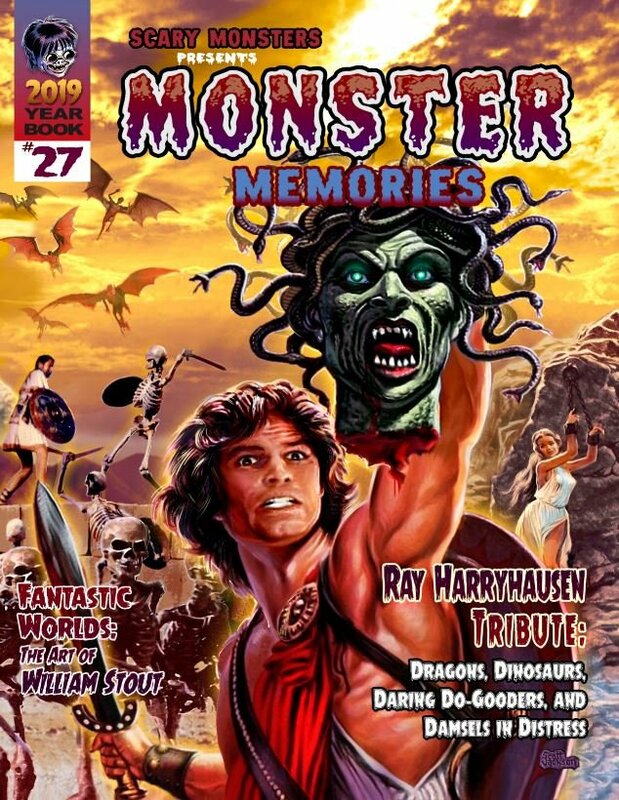 They are generally available for 3 issues (which may include the next Monster Memories Yearbook depending on when the subscription goes into effect) and 5 issues, including Monster Memories. Once purchased, and the first issue is received, the subscription will run its full term and cannot be partially refunded if ended prematurely. Add $1 per issue for "bagged and boarded" copies. Shipping is included in the prices for U.S. and foreign orders. Shipping insurance is not available for subscriptions, so do not select insurance in the shopping cart. If you require insurance, you must order each issue separately rather than through a subscription. The reason is that subscriber issues are mailed in an envelope, while individually purchased copies are mailed in a stiff cardboard mailer. Scare Mail Submissions are welcome! Scary Monsters Magazine and Monster Memories are “for Monster Kids, by Monster Kids” so we encourage your letters. All letters become the property of the magazine and may be published in whole or in part. We can’t be responsible for unsolicited photos, artwork, articles or other material and cannot return unless sufficient postage is included. Any material should be discussed with the editor before submission. 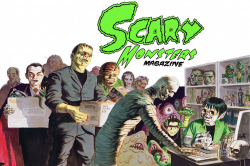 Wholesale Direct copies of Scary Monsters #101 and subsequent issues, as well as the Monster Memories #24/25 2016/2017 Yearbook and subsequent issues, are available by clicking here. However, the current issue, as noted in the wholesale direct listing, is not available to retailers planning to sell copies on any auction sites such as Ebay. We reserve the right to deny wholesale purchases to any retailer not following this policy. For pricing, deadlines and technical details, click here or contact us by phone, email or U.S. mail at the number and addresses above. We also manage MakeYourDomain.com, a domain registration and website services portal focusing on the small and home-based business market. Everything needed to register, launch and market a personal or business website is available at reasonable prices and backed by the top domain registration company in the U.S. Find out more by clicking here. We truly appreciate your beastness! Our companies are small yet professionally maintained operations. This gives us the ability to ship quickly and respond to your special needs and requests. We pride ourselves on our fiend-ly customer service, and we enjoy hearing from customers who love monsterdom as much as we do! 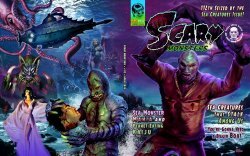 MyMovieMonsters.com and Scary Monsters Magazine are not manufacturers, and we do not conduct any tests on the merchandise we sell. The items we sell are NOT intended as toys for youngsters. They are products designed for and marketed to adults and are not meant for children unless the manufacturer packaging clearly provides a suggested minimum age. We assume no liability regarding product safety of any kind. Any questions or complaints should be directed to the individual manufacturers. Collectibles we offer for sale, unless otherwise noted in the item description, are new and factory sealed. Many of the Sideshow Collectibles action figures we offer are pre-owned (a better term than "used" for these purposes) but the figures, unless noted, have never been removed and displayed. To give collectors a general idea of the condition of the packaging or display box for each figure, we use the widely accepted rating system C1-C10. C10 is considered true mint. The packaging is glossy, with no visible defects, and often picked right from the manufacturer shipping carton. C1 means the packaging or display box shows significant handling damage but contents are intact. Lower graded items are perfect for those who wish to discard the packaging and display their figures. You will find most items fall in the C6-C9 range. Please keep in mind that we are not professional graders. Magazines and Comics are new and picked from the publisher or distributor shipping carton, unless otherwise noted in the item description. Most we would consider Near Mint. As is the case with general collectibles, we are not professional graders but do provide an accurate description of any printer defects or other information collectors would be interested in. We cannot guarantee Mint or perfect copies of the magazines we offer, particularly those shipped to us from the UK, but upon request we will ship the best available on hand. Newly released and stocked issues stand the best chance of being in excellent condition. We respect your right to privacy and only collect information to complete or give the status of your order. This info includes your name, email, shipping/billing addresses, credit card details, and phone number. We will never rent, sell or share your personal info for any reason.